This is a deceptively simple soup, requiring the cook do little more than simmer the cauliflower in milk for 20 minutes. Robert Reynolds shared this recipe with me, years ago. (Robert Reynolds) If there's a vegan among your holiday dinner guests, an equal amount of coconut milk can be substituted for the cow's milk. Both offer a thick, creamy texture and neutral background flavor to showcase a bold garnish like spicy peppers, a drizzle of reduced balsamic vinegar, or pickled vegetables. Even though cauliflower doesn't contain starch, it purees like a potato, with a creamy full-bodied texture that never runs the risk of becoming gluey! Fresh horseradish is readily available throughout the winter months, and adds an aromatic and bold accent when freshly grated, without the spicy heat that most of us associate with prepared horseradish. I love fresh horseradish in potato puree or with another winter treat: freshly shucked oysters with lemon. I am less fond of nutmeg, but it really rounds out the flavors in this recipe. Don't add lemon juice, which will curdle curdle the cow's milk. Instead, use a bit of freshly grated zest on top for a citrusy note. Break or cut the cauliflower head and stem into smaller pieces, then roughly chop to make about 4 cups. Place the cauliflower, onions and milk in a 2 quart saucepan with the salt and bring the mixture to a simmer over medium high heat. Once the milk comes to a simmer, reduce the heat slightly and use a ladle to skim off any foam or debris that rises to the top. Gently cook for 20 minutes or until the cauliflower is soft. Add the nutmeg and allow to cool slightly before pureeing in a blender until smooth. To serve, warm the soup over low heat and season to taste with additional salt. 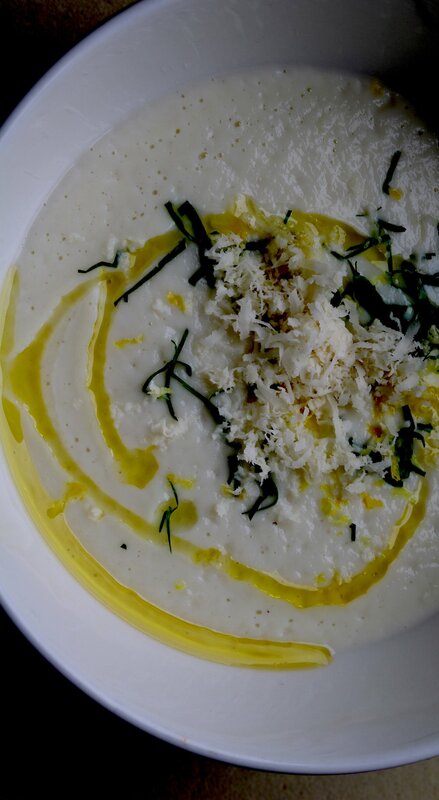 Ladle into warm bowls and garnish with the lemon zest, freshly grated horseradish, and a big pinch of parsley. Drizzle with some good olive oil if desired.